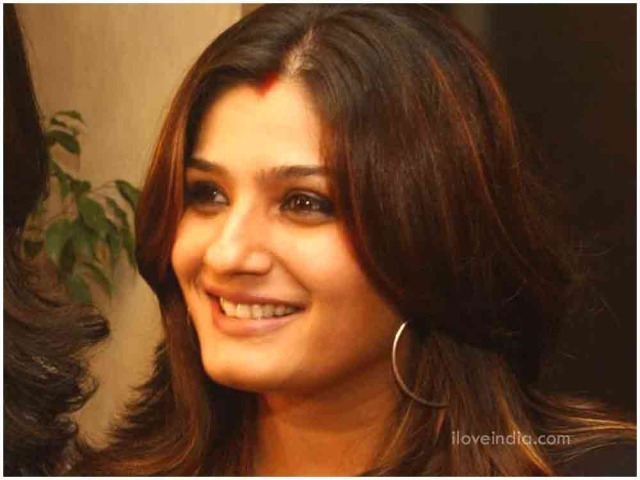 Raveena Tandon was born 26th on October 1974 in Mumbai, to filmmaker Ravi Tandon and Veena. Her name is an amalgamation of her parents' name. She attended Jamnabai Narsee School in Juhu and studied at Mithibai College. She completed her first and second years at the college. During her time as an intern, she got her first film offer from Shantanu Sheorey which she accepted.She dropped out of college and decided to pursue her film career. Her father was a producer and director of some films in the 1970s and 1980s. She has a brother named Rajiv Tandon. Her cousin, Kiran Rathod is a South Indian actress. Aamir Khan born as Aamir Hussain Khan on 14 March 1965 in Bandra's Holy Family Hospital, Mumbai, India, to a Muslim family that has been actively involved in the Indian motion picture industry for several decades. His father, Tahir Hussain, was a film producer while his uncle, Nasir Hussain, was a film producer as well as a director and an actor.He is a descendant of the Muslim scholar and politician Maulana Abul Kalam Azad and a second cousin to former Chairperson of Rajya Sabha Dr Najma Heptullah. The controversy king of Bollywood Salman Khan recently purchased an Audi A8 that ranges from Rs. 71 lake to Rs. 1 corer in India. It is well known that Ajay Devgan is a car fanatic and his cars collection prove just that. Along with a Maserati, Ferrari and a Mercedes Z-class, he has recently acquired a modified Toyota Celica. The macho film star owns a variety of cars including a Lexus SUV, Mercedes Benz M-class, Porsche SUV and a Toyota Land Cruiser. When it comes to luxury cars, Rani Mukerji does it the best. She is a proud owner of a Mercedes Benz E-class. With a price tag of Rs 44 lacs, the car features impeccable style and remarkable performance. The Miss World turned Bollywood actress Priyanka Chopra would settle down for nothing but a Porsche when it comes to car. She owns a Porsche Cayenne priced between Rs 64lacs to 1.46 crore . Actress Katrina Kaif has a passion for F1 and owns a full-size luxury SUV Audi Q7. The price tag ranges from Rs 55 lacs to 69 lacs. Kareena Kapoor owns an SUV Lexus LX 470. The car comes with a price tag of approximately Rs 36 lacs. The famous South Indian actor Kamal Hassan owns a Hummer H3. The price tag of the car is approximately Rs 1.5 crore. John Abraham who is famous for his bike mania, likes to drive around in style and luxury and owns an Audi Q7. The Emperor of Bollywood Hrithik Roshan drives in style with a Mercedes Benz S-class. This luxury car comes for a price ranging between Rs 77 lacs to 2.4 crores. is a proud owner of a Porsche Cayenne. The car cost ranges from Rs 65 lacs to 1.46 crore. With roomy interiors and sporty exteriors, Toyota Camry is what catches Asin’s fancy when it comes to cars. The car price ranges from Rs 22 lacs to 25 lacs. Rolls Royce Phantom worth approximately Rs 3.5 crore was gifted to Amitabh Bachchan by director Vidhu Vinod Chopra. Phantom is one car where cutting edge technology and traditional craftsmanship skills come together. Bollywood heartthrob Abhishek Bachchan drives a Bentley, which is a gift from his dad. The car costs around Rs. 2.25 crores in India.